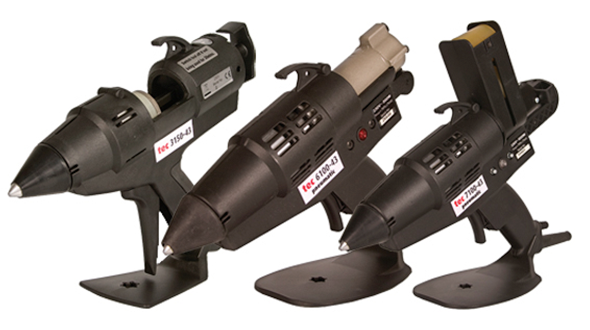 Gluegunsdirect.com are dedicated to supplying hot melt adhesives and application equipment to meet the ever changing and challenging materials used in today’s woodworking and furniture industry. With a comprehensive range of hot melt and aqueous adhesives, we have every application covered. Tecbond 135 shaped hot melt adhesives is used for general woodworking assembly, mitre joints, templates for granite worktops, fixing of moulding to coffins, staircases, trimmings and edgings, draw assembly and picture framing. Also used by carpet fitters and flooring contractors for attaching tack strips (gripper rods) to concrete, wood and tiled floors as well as attaching door bars, stair nosing, laminate floor trim. Tecbond 135 hot melt adhesive is a long open time product with good heat resistance and good adhesion to soft and hard woods, plus rigid PVC, polystyrene, foams and fabrics. Available in 12mm, 15mm glue sticks and 43mm glue slugs.